I used to be a big scrapbooker. Of course, that was before the days of digital photography. My two oldest kids have great scrapbooks of their baby years. By the time kiddo number 3 made his debut, film was beginning to disappear and digital cameras were gaining popularity. His scrapbook only goes up to his 1st birthday. By the time my 4th kiddo was born, all our photos were being uploaded right to the computer. That's when I quit scrapbooking. I didn't have photos sitting around making me feel guilty if I didn't put them in a book. They were on my computer. Out of sight, out of mind. I tried my hand at making a digital scrapbook, and succeeded at getting a small one done for my last baby. Lately, however, I've noticed how many photos I have sitting on my hard drive. I've started feeling a need to get them in hard copies. I want to put them in books just like all the hard copies I used to have sitting around. 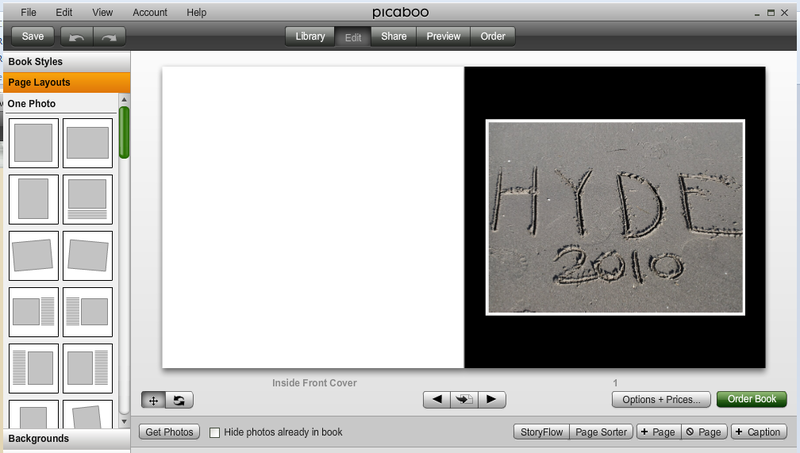 When I was approached with the idea of trying Picaboo, I was so excited! I mean look at those faces!! How could I not put them in a scrapbook? And a digital photo book was the perfect solution. So I decided to create a family photobook for 2010. The whole year. And you know what? It was easier than I thought it would be. Using Picaboo was very simple. I signed up for an account and downloaded the program right to my computer. Uploading photos was a breeze as well. 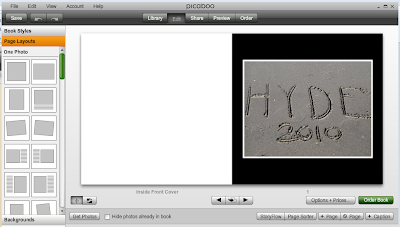 The program uploads photos very quickly, then you can check which ones you want to use in the book. I made it easy for myself by putting all the photos I wanted to use in my book in a single folder on my computer. Then I just checked all of them and uploaded them at once. A much faster process than I expected. The program gives you the option of letting it auto fill a book, or allowing you to create one from scratch. I chose the "from scratch" option. It was easy thanks to the user-friendly program. I could choose the page layout, color, text and everything. So easy. Here's a screenshot of the program with my finished book sitting on its virtual "shelf". I'm so excited to get my finished copy!! 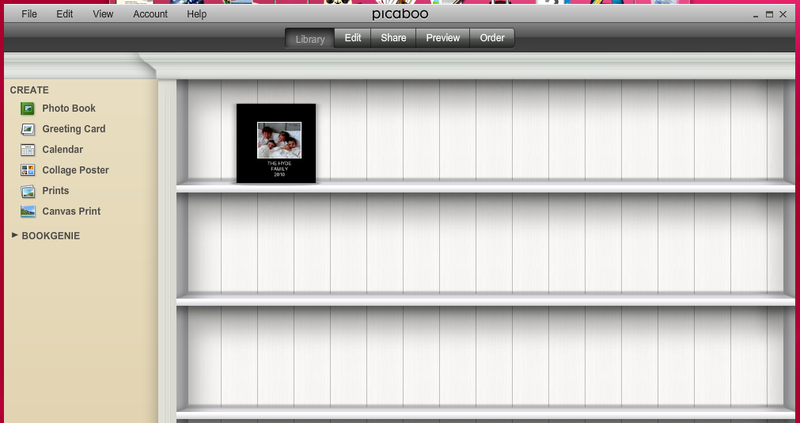 Overall, I was really impressed with Picaboo. It was easy to use and their product selection is great. If you'd like to try Picaboo out for yourself, here is a link to their current special offers which include up to 40% off any classic book style, and 15% off on card orders of $20 or more. I have always used Shutterfly's books. I would love to try this. It sounds like there is more versatility. Thanks for sharing! The only thing I ever worry about with photo books like this is "how long will they last?". I, like you progressed into the digital age and am behind (that's a major understatement) on scrapbooks or photo albums for my kids/family. But I know the photos I PRINT are archival quality & between paper/products will last. I don't know anything about the lasting of photo books. I'd feel awful if I grabbed a photobook off my shelf in 10 yrs and the photos had faded. No clue if that would happen - can you fill me in on the staying power? I'd LOVE to jumpstart my photoalbums this way!! thanks! i have bins and bins (4 large rubbermaid) of photographs. now i have files and files of digital! its all a mess and one day i should organize it. for most of these years its been enough just to have the pictures. i am a 4th and last kid in my family and have only seen 3 or 4 toddler pictures of myself and there isnt a baby book. so my kids have grown up with a camera in their face.